The mine is jointly owned by Aquarius Platinum South Africa (AQPSA) and Anglo American Platinum (Amplats). Proven and probable reserves are estimated at 15.61mt graded at 3.14g/t of 4E. Marikana was initially developed through the West-West and Main open pits, which were mined out in 2011. Marikana is AQPSA’s second operating mine in South Africa. It is located eight kilometres away from the company’s flagship Kroondal mine. In June 2012, the partners announced their decision to suspend production at the mine due to low platinum prices and high operating costs. The mine has been placed on care and maintenance until economic conditions and low Rand PGM prices improve. At the end of June 2012, 1,309 people were employed at the mine. Following the temporary suspension of operations, 84% of the mine’s employees were re-assigned and re-allocated to other jobs, mostly at the Kroondal mine. The PGMs produced at the mine include platinum, palladium, rhodium and gold (4E). As of June 2012, the mine holds 1.57 million ounces (oz) of mineral reserves. Measured resources of the mine are estimated at 8.86mt graded at 5.37g/t of 4E. Indicated resources are estimated at 5.85mt graded at 5.03g/t of 4E. Inferred resources are estimated at 1.82mt graded at 3.42g/t of 4E. "The PGMs produced at the mine include platinum, palladium, rhodium and gold (4E)." The mine is located in the western part of the 66,000m² Bushveld Complex, which is comprised of the Marikana and 4 Shaft orebodies. The Upper Group Two (UG2) reef of the Bushveld Complex is exploited in both orebodies. The Marikana orebody, which measures 1.5km by 1.3km, has a basin-like shape. It dips down towards the centre at angles of 10° to 20° to a depth of 200m. The 4 Shaft orebody lies near the Kroondal Block of the Kroondal mine. Its geology is different from that of the Marikana orebody and dips northwards, at an angle of 90o. The 4 shaft orebody includes two mineralised zones – Main and Leader seams. The two zones are separated by a 1m pyroxenite zone. Marikana was initially developed through the West-West and Main open pits, which were mined out in 2011. The main pit remains open providing access to 1 and 2 shafts. "Marikana is AQPSA’s second operating mine in South Africa." The mine is accessed through five decline shafts – 1 shaft, 2 shaft, 4 shaft, 5 shaft and 6 shaft. Mining is carried out at depths of 450m through shafts 4 and 5. Shafts 4, 5 and 6 are on the outcrop. Just prior to the end of June 2012, given the challenging operating and economic environment, the operations at the Marikana operation were suspended and the entire mine placed on care and maintenance. Mining is carried out through a bord and pillar method. The mine is partially mechanised with hand-held drilling and bolting used for mining. The recovered ore is hauled by truck to the concentrator plant for processing. 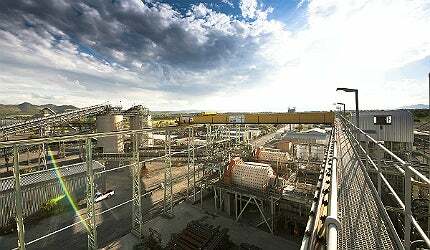 The concentrator plant at Marikana has a processing capacity of 220,000t of ore each month. It includes 30 run of mine (ROM) semi-autogenous mills and a smelter with two 37mw absorbed arc electric furnaces. The recovered ore undergoes three stages of crushing in a large gyratory crusher and two additional crushers. It is then treated using flotation and dense media separation (DMS) methods to recover PGMs concentrate. As of June 2012, the mine’s PGM attributable production was 51,369oz, which represents 12% of the group’s production for the 2012 financial year. This was a decline of three percent from the 52,962oz produced the previous year. Cash costs were $1,319 per PGM oz. The entire production from the Marikana block is sold to Impala Refining Services as part of a life-of-mine offtake agreement but concentrate production from the new ground from the 4 Shaft orebody is sold to Anglo Platinum. The project is located on the western limb of the Bushveld Complex in South Africa’s North West Province. Phoenix Platinum Project includes the production of platinum group metals (PGMs) from mines located in the Northwest province of South Africa. The Modikwa platinum mine lies along the border between the Mpumalanga and Limpopo provinces, around 15km north-west of Burgersfort.